Free updates on the latest offers, new arrivals, feng shui tips and etc. 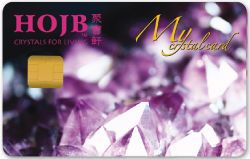 Members can only enjoy the benefits of “My Crystal Card” by presenting this card at any of HOJB outlets. The activated “My Crystal Card” must be presented at the point of purchase to enjoy the offers and to collect points. “My Crystal Points” can be earned by purchase in any HOJB outlets only. The accumulated points under this “My Crystal Card” do not have any cash value and can not be redeemed or exchanged for cash. Accumulation of “My Crystal Points” will only commerce after the card has been activated. All the free services provided are only for the products of HOJB with terms & conditions applied. Voucher redemption is only applicable for accumulated point collection of 500 or above upon expiry date of membership. For those member who has accumulated point collection lesser than 500; is not eligible for voucher redemption. However, the collected point will be carry forward to the following year upon renewal of their membership in 3 months time. All the programs of “My Crystal Card” are subjected to the terms & conditions which include such terms & conditions as may be varied, supplemented or modified by HOJB Sdn Bhd at its sole discretion from time to time without prior notice. If “My Crystal Card” is lost, damaged or stolen, HOJB Sdn Bhd reserves the right to impose a fee for new card replacement (RM20.00 of replacement fees will be imposed). HOJB Sdn Bhd reserves the right to change the terms & conditions without any prior notice. Only RM20.00 joining fee per year and fill up the registration form at any HOJB outlet near by.